Fig. 6.1-1. Longitudinal section of shoot tip of coleus (Coleus). The central vertical structure is the shoot tip, which ends in the shoot apical meristem (the reddish structure with two horn-like leaf primordia). 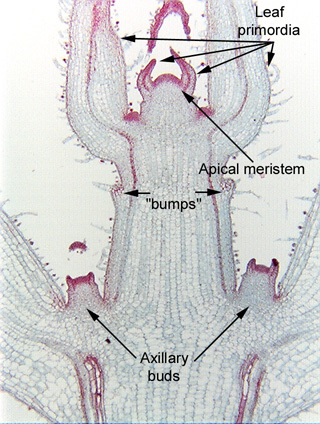 On either side of the apical meristem are two larger leaves that extend up out of the top of the micrograph. In the lower third of the micrograph are two axillary buds, each with two small leaf primordia. Coleus is a favorite plant for teaching about apical meristems and leaf production because it has decussate phyllotaxy (that is, each node has two opposite leaf primordia, the next node down also has two, but which are arranged at 90 degrees from the two above). We can see two young leaf primordia (the "horns" on the apical meristem), then two older ones, and finally two even older leaves that have the two axillary buds. Notice that there are bumps on the surface of the stem, above the two axillary buds -- those are the very edges of another leaf pair, with one leaf going back into the screen and the other coming up at us (both leaves have been cut off). In plants that have distichous phyllotaxy (with just two rows of leaves, as in irises), a median longitudinal section like this would pass through every leaf (or with a different orientation, it would miss every leaf). In plants with spiral phyllotaxy (just one leaf per node), a median longitudinal section often misses many leaves, or just barely passes through one of their edges.